The Pullman Al Shahba Hotel Aleppo is located in an attractive residential area close to downtown and historic city center providing a great location with free parking. The Pullman Al Shahba Hotel Aleppo provides a variety of outlets for exquisite dining and entertainment. Complete full banquet facilities for occasions like business seminars and weddings. LA VERANDA for the best home made Aleppo traditional / oriental food. An elegant setting in Pullman Al Shahba Hotel fine ” a la carte ” Italian restaurant. Pullman Al Shahba Hotel Italian chefs will prepare the best Italian and Mediterranean cuisine right in front of your eyes. Served with an extensive selection of French and Italian wines. Pullman Al Shahba Hotel live trio band provides the most relaxing atmosphere. In the summer time, enjoy Pullman Al Shahba Hotel outdoor terrace with Pullman Al Shahba Hotel barbecued dishes and open buffet. The un Pub, with live Satellite TV, popular for cocktails and light snacks provides an entertaining setting. Wind down and sip a relaxing cold beer after your long day. Have fun by playing snooker on Pullman Al Shahba Hotel elegant table. Enjoy Pullman Al Shahba Hotel street side café, where we serve the best brewed coffees, beverages and pastries. The café is usually buzzing with guests and locals popular for relaxing conversations. Great atmosphere for fun and dancing. Entertain yourself with the best disk jockey in town. >> 24 hours room service. >> Daily laundry and dry cleaning services (7 days/week). >> Airline ticketing and reservation center. >> Car rental agency (Europecar ). >> Full limousine and taxi service, located in the hotel lobby. >> Beauty Saloon, offering full hair dressing and beautician services. >> Oriental gift shop where you can find the best authentic hand made products. 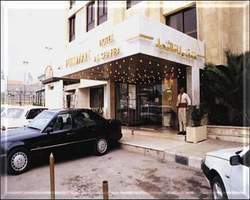 >> Pullman Al Shahba Hotel convenient store.